In the early days of WordPress — or for blogging in general, for that matter — there were no easy ways to get the word out to others when you published new content on your site. One way was through a service called weblogs.com. People could use this service to subscribe to notifications for their favorite sites. And content producers could then use weblogs.com to send out notifications of new content to the subscribers who chose to follow their site. These notifications could be performed by filling out a form, or via an automated method called a “ping”. Soon, several other ping services popped up, some covering special topic niches, and eventually most of the major search engines and content directories (Yahoo!, Google, Technorati, etc) began supporting ping interfaces. By sending a ping to these sites, you could get your content indexed much more quickly than if you just waited for their site spiders to make their scheduled runs. After a time, it became cumbersome to visit multiple sites to alert them of new content. I created a system which let you send pings to multiple services via a single interface. WordPress co-founder and fellow developer Matt Mullenweg contacted me about expanding this service, and in April of 2004, we launched Ping-o-Matic. 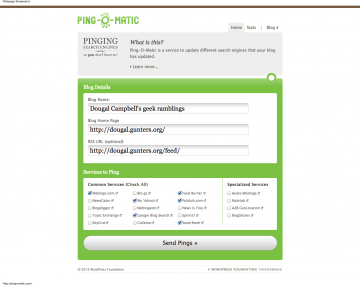 Soon afterwards, we made Ping-o-Matic the default ping service for WordPress. And it didn’t take long for other web projects to add support, either directly, or via plugins. Eventually, Matt and I donated the Ping-o-Matic service to The WordPress Foundation. Today, Ping-o-Matic supports 19 different ping services, and sends out around 50 million pings every day, on average.